So a few weeks ago we had those big old, dangerous Maple trees removed from our front yard. That really tore up what little grass we had. After that I knew I didn't want to try to plant more grass. Grass needs to be taken care of and mowed and I wanted something that took less care but looked great. 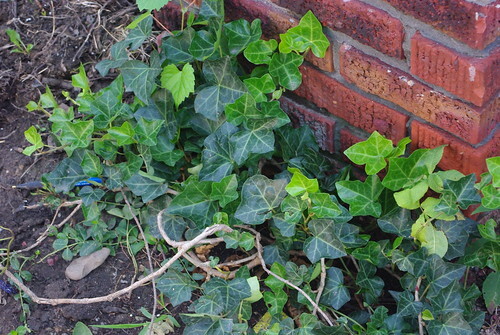 So when Mr. Pete was digging trenches in front of the house, he tore up some English Ivy that we have growing along the side of the house. The big shovel just tossed it in the air and it landed in a flop. I didn't do anything with it, but soon enough it had re-established itself! 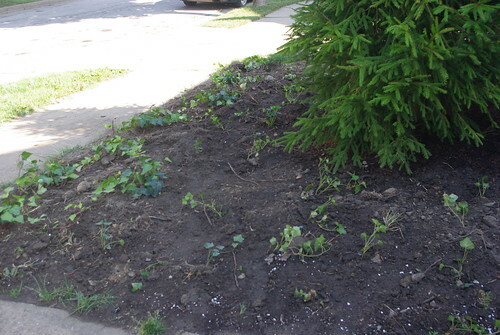 So I just loosened the dirt in the front and planted English Ivy around our new tree. Hopefully in a few weeks it will look as lush! about the upcoming school year and how I should probably start planning for it! We are going to finish American History and then go back and to world history. I am a little anxious about our portfolio review coming up. that after all of these years, I really have a lot of resources available to me. One of the blessings of a large family is that I can continue to re-use things like math books! Hopefully some science tests this week too. Start to work more with Izzy on writing - especially to her new pen pal. Thinking hamburgers on the grill for tomorrow and perhaps taco salad on Tuesday. A very cute denim dress I got for $3 at the Village Discount store. It has pretty embroidered flowers and birds on it and is very, very comfortable. to pray and to be thankful. a new front lawn. We did NOT go with grass because grass needs to be watered a lot, mowed and cared for. 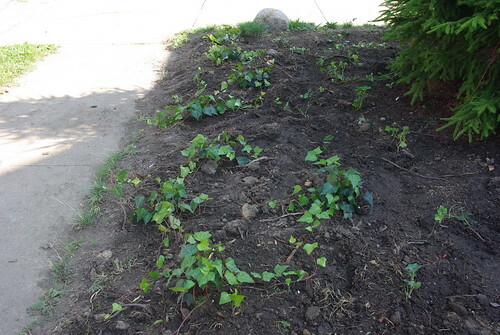 Instead I have invested in sime English Ivy plants and have one side of the yard in that. Hopefully it will fill in and look better before the end of the season and in a few years it will be full and lush. to a county fair to hear the kids' band play. They have been so awesome at getting gigs for themselves. Mr. Pete gets his side job done soon because I am really, really, really tired of these 14 hour work days! Not much planned for this week, but hope to have the inside of the house in good order by next week including the laundry room. This is a shot I took of a friend of mine running in the Run for Life 5K last weekend. 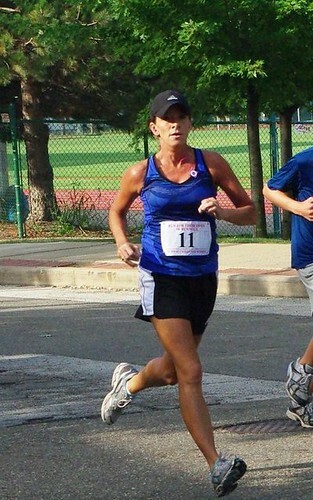 I sent it to her and she said she usually doesn't like pictures of herself running but she loved this one and even put it as her FB picture. That really made me happy. I think what I love about photography is it lets me be part of the action, without being part of the action! Although, when you are shooting cross country or 5Ks you do a lot of running of your own from place to place trying to get the best shots!